Key Difference: Hiking boots and backpacking boots to many are essentially the same. People that are planning to stick to the walking trail and will not be doing anything that requires special demands can opt for hiking shoes. However, people that plan to climb rocks, trek through mud, walk through rivers and streams require a heavier and sturdier backpacking shoes. Purchasing shoes are a big investment that gives off immense returns specially when required for a demanding activity such as backpacking or hiking. Hiking and backpacking requires a person to walk through various different kinds of trails. The type of shoes a person wear are decided by the itinerary that the person has and all the activities that he/she are seeking to complete. People that may be looking to do more off-trail activities would require thicker and stronger shoes, while people that are just looking to walk on a trail require lighter and comfortable shoes. How do you decide? Well, again this depends on what’s the plan. Hiking boots and backpacking boots to many are essentially the same. Many people hike on hiking trails and then camp out before continuing on with the journey. People that are planning to stick to the walking trail and will not be doing anything that requires special demands can opt for hiking shoes. However, people that plan to climb rocks, trek through mud, walk through rivers and streams require a heavier and sturdier backpacking shoes. When planning it is best to ask an expert when purchasing the shoes and let them know what your plan is. However, there are some things that a person can do to decide if the shoes are right for them. The shoes should be comfortable, durable and offer proper support. Price should not be the only factor, not all expensive shoes fit the same for different people. If a person is planning a short trip that is not demanding then again lighter shoes are a better option as the person would not have to walk long distances. People that are planning to take long distance require sturdier shoes that can stand a little abuse. 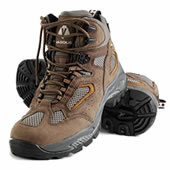 Hiking shoes are more flexible, running shoes that provide comfort and support to the base of the feet. On the other hand, hiking boots are a bit more durable than hiking shoes. They are flexible and supportive. 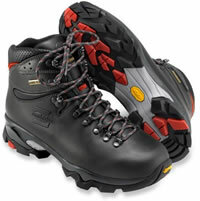 Backpacking boots are designed to carry weight and able to support various different terrains. They have stiffer midsoles compared to hiking boots and shoes. Backpacking boots also provide great ankle support making it easier to carry heavier loads without putting pressure on the ankle.